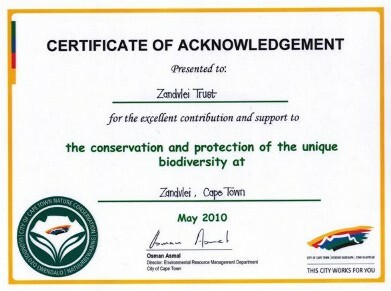 City of Cape Town thanks Zandvlei Trust members - 22nd May 2010. Long Service Awards at the 20th Anniversary of Zandvlei Trust - May 2008. Vincent Marincowitz, Joye Gibbs, Cherry Giljam and Una Hartley. Read more about these hardworking people. 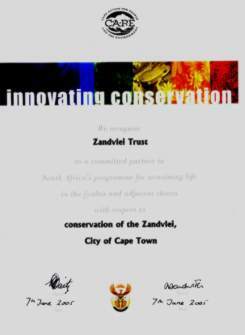 CAPE - Award to The Zandvlei Trust. Cape Times / Caltex - Award to The Zandvlei Trust.